Edward Rutherfurd is best known for his sweeping intergenerational epics. At 832 pages, his latest novel Paris certainly requires the character list and family tree at the beginning to help the reader keep the names straight. The story shifts as well among time periods — we move from the building of the Eiffel Tower to a revolutionary group years later then to a point earlier in Paris history and back again. Rutherfurd’s story is sweeping and historical, a grand narrative about a city as seen through the eyes of its characters. That description intrigued me — I expected to feel bad for the daughter, as well as for the Frenchman’s son, who after all might have had a fairly peaceful romance if not for the mother’s clinging on to her past. And indeed when this part of the story came up in Paris, I remembered Rutherfurd’s speech and my prediction. I did feel bad for the parties involved, I was also relieved that Hemingway’s part turned out to be more peripheral than I feared (some authors can’t resist the temptation to reference historical figures liberally). More than anything however, I was surprised at how small a part this thread is in the overall story. Prior to the intergenerational love triangle, and at times interspersed with these scenes, I’ve read the mother’s own story of lost love. That actually turned out to be my favourite subplot in the entire novel — I was so caught up in the story I almost forgot her romance was doomed to fail, or more likely, I wanted to believe I could somehow change what Rutherfurd had written. I wanted her romance with the Frenchman to succeed. The story of a young girl falling in love with a more sophisticated man who saw her only as a child is such a classic trope, and I love the delicate touch with which Rutherfurd treated this storyline. It’s easy for subplots to get lost in such a sweeping epic, and certainly, some of them barely interested me at all. At the same time, however, the subplots that do catch each reader’s eye stand out all the more for it. 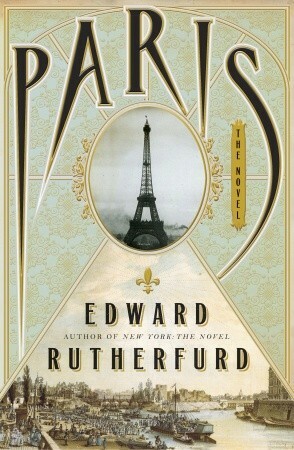 Rutherfurd’s story of Paris reads like a carefully curated history — bits of personal stories the author chooses from countless others and stitches together. It’s a work of fiction, but intertwined with so much historical detail that it feels like part of history. And just like Rutherfurd chooses which figures to focus on, so do we readers get to choose which plot threads strike a chord within us. Rutherfurd may be writing his personal history of Paris, but we in turn get to read our own personal version of his history. Paris is a book in which to lose oneself. As with any historical epic, some coincidences stretch credibility, but Rutherfurd’s writing nevertheless pulls you in. From romance and relationships to revenge and revolution, Rutherfurd’s Paris is a beautifully crafted intergenerational, multi-family epic. With so many characters and so many plot threads, it’s hard to imagine this book feeling intimate. And yet Rutherfurd’s skill makes it so. This entry was posted in Book Reviews and tagged 50BookPledge2013, Fiction, Historical, Random House by Jaclyn. Bookmark the permalink. Interesting observation,that it still feels like an intimate story despite its heft and girth; I haven’t read one of his novels yet, but I keep picking them up and pawing at them.I should just take the plunge one of these days: you make it sound wholly enjoyable!